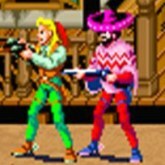 Description: Sunset riders is a classic 2D platform shooter that is not remembered enough. The player plays as a bounty hunter out to take out and collect money on all of the criminals that need to be taken down. Travel from town to town shooting bad guys and fighting bosses. There cool levels where the bounty hunter rides horses and fights on top of old trains. Its a simple game done right with a lot of western action and levels that have a lot of variety. Game Controls: Shift Key = Insert Coin. Enter Key = Start. Arrow Keys = Move. "Z", "X" Keys = Action Buttons. Select the option icons located at bottom of the game screen to edit controls, Play In Full Screen, Save/Load game progress, and change graphics settings.